This aerial view from the Winter Garden water tower highlights the business district of Downtown Winter Garden, Florida, and some of it's prominent buildings in the 1920s. Those buildings include the First Baptist Church, South Apopka Supply Company, and the Tavares & Gulf railroad depot, all visible on the left hand side. On the right is what used to be the Gem Supermarket. In the center of the photograph is a two-story building that is now occupied by the Winter Garden Feed Store. 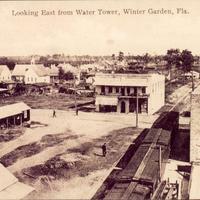 Looking East from Water Tower, Winter Garden, Fla.
“Aerial View of Downtown Winter Garden.” RICHES of Central Florida accessed April 21, 2019, https://richesmi.cah.ucf.edu/omeka/items/show/4651.